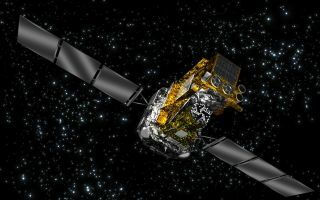 This week, ESA’s Integral space observatory celebrates ten years since launch on Oct. 17, 2002. This week, ESA’s Integral space observatory celebrates ten years since launch on Oct. 17, 2002 in this space wallpaper. Integral, short for International Gamma-Ray Astrophysics Laboratory, is equipped with two gamma-ray telescopes, an X-ray monitor and an optical camera. All four of Integral’s instruments point simultaneously at the same region of the sky to make complementary observations of high-energy sources. Integral is often bathed in gamma-ray bursts, the death cries of massive stars that have burned up their fuel and exploded as a dramatic supernova, blasting high-energy radiation through the Solar System on a near-daily basis.